Both Adam (my husband and Moink Co-Founder) and I grew up on family farms in the Midwest. We both left those family farms after school for the East Coast where Adam worked as an engineer and I as an organic produce lady, setting up organic produce box companies all over the country. A few years ago we moved back home to the Heartland and traded in our house in the suburbs for a farm, which we have slowly been transforming to certified organic. We planned to go through the certification process, grow vegetables and then help other farmers learn to grow organically and be sustainable. Adam started raising hogs on the back woods of our property. Why hogs? Well, when we lived in the city I REFUSED to eat pork from the grocery store. I told Adam, “It tastes like a confinement building smells.” Plus, I’m not down for the torture of animals (the reality of factory farming). I’m a carnivore, but I’m a tender-hearted one. 7 years on a pork hiatus and my dear husband just wanted a pork chop! I told him that if he raised a hog like my mother used to (outdoors on clean, green grass) I would cook all the pork chops his little heart desired. So he did, and the quality and flavor were amazing. Next, our friend Kim (who raises grass-fed beef) called to see if we had any ideas for connecting other tender-hearted carnivores with this awesome meat we were raising. Then, our friend Janel began talking with us about her chicken. It’s the best chicken you ever did eat. Why is her chicken so delicious? She raises them outdoors, with plenty of fresh grass and a diet of bugs and Non-GMO grains. The same thing came up…how do we get this to the consumer? Right now the food system is set up so that if you raise animals you can sell them, but only at the local “sale barn” where, chances are, they will end up in the hands of one of the “Big Four” meatpacking houses in the country. From our experience it seems that these companies have no desire to help the farmer or care for an animal. Everything comes down to making money. And it seems like a tragedy to let our animals end up in their hands. What if we set up a process like we do with the produce boxes and ship it? 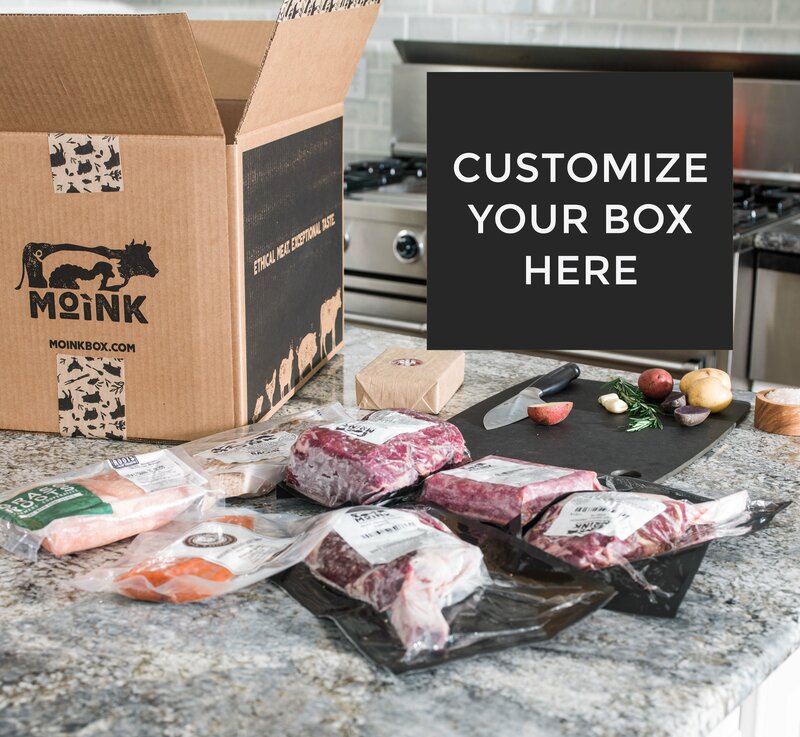 It would be easy for the consumers (make a few selections and meat arrives on their doorstep) and can help farmers plan well and connect with consumers. I knew that in order to sell nationwide we would need more growers. Our farms are not big enough to feed everyone and, quite frankly, we don’t want them to be. Part of the reason our meat tastes so delicious is because we are small. Our animals are cared for properly, with plenty of room to live well. Janel raises her chickens in chicken tractors (allowing chickens to roam free while offering protection from predators), which her husband Chris moves 4 times a day. If she ramped up the production there just wouldn’t be enough time in the day for that. Adam names each and every one of our hogs, giving them personal attention to make sure they are happy and healthy. When you get big, you can’t do that. Raising grass-fed beef that utilizes rotational grazing (moving the cattle regularly to fresh pasture) is a lot of work. You can’t do that when you are big. So, we don’t want our farms to be big. We just want them to be the best! There are plenty of farmers out there in our same shoes. They are raising their animals right and they’re fed up with the hijacked food system. They also want a way to connect to the consumer. John, a nearby farmer, was raising and shipping grass-fed meat all over the country. We called him up and asked if he would be willing to help us. “Absolutely,” he said! Together with his farmer network and ours we knew we would have the supply without sacrificing quality. We are THRILLED to launch Moink as part of the solution. We are connecting ethically-conscious meat lovers to quality food by helping farmers farm and people eat. Our vision? To become a go-to source for humanely-raised and ethically-sourced meats for the consumer, as well as an outlet for grass-based farmers to sell their proteins. We can’t do it alone and it won’t be easy, but together we can become a formidable opponent to the corporate giants currently hijacking our food system. Together we can reclaim our land and our dinner plates…all while enjoying the best darn ribeye you ever did taste!